HomeDriveway AlarmsReceive Text Messages from your Driveway Alarm! Receive Text Messages from your Driveway Alarm! There has long been a desire for a quick and easy method to have driveway alarms send out text messages alerting the appropriate people whenever the driveway sensor is triggered. 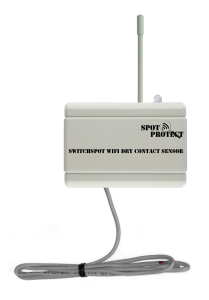 All of the driveway alarms we carry (other than the STI systems) feature relay outputs which can easily be connected to the all new SWITCHSPOT, a dry contact sensor with WiFi capabilities. The SWITCHSPOT is part of the SpotProtect line of products meaning it will automatically send out E-mails and text Messages via the SpotProtect cloud server whenever your driveway alarm is triggered. This addition to an existing driveway alarm is perfect for letting businesses or home owners know if a vehicle enters their property while no one is there. Send Text Messages from your Driveway Alarm!